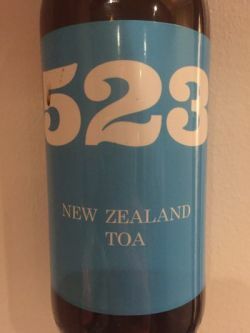 UPDATED: MAR 15, 2019 330ml bottle served in an English pint glass. Pours a brown color forming a medium and very persistent tan head that leaves some lingering lacings formed and left in the glass. Nose is full of coffee and dark chocolate. Roasted malts. Slightly sweet upfront taste. Strong notes of roasted malts, dark chocolate, coffee beans, wood, grassy hops. Medium body. Medium carbonation. Roasted malts and grassy hops in the afteraste. Great drinkability. Excellent black IPA. Really sad to know that this is a retired brewery. Bottle split at CBC Islington, thanks to Tipple, A, 26/04/17. Light black with a well appointed tan covering. Nose is charr, spice, pine needle, burnt toffee. Taste comprises earthy fruits, pine needle, charr, mellow roast, tropcial fruti rinds, black peppery spice, light perfume. Medium bodied, fine carbonation, drying close spiked with earthy hop bitterness. Decent CDA. Craft Islington bottle share. Thanks to Ade Opaque dark brown beer, tidy pale tan head. Palate is airy and semi dry, good fine carbonation. Smooth dry dark malts, some cream. Good spicy pine hops. Spicy tangy dark fruits. Tangy dry spicy finish. Comes together well. 330ml bottle, from trade with Anstei. Many thanks chap! Pours deep dark with a large frothy tan head. Aroma of charred wood, ash, pine. Brilliantly balanced taste, good roast and pine with a nice ashy bitter finish. Very impressed! Bottle at Craft Islington, big thanks to Mr Tipple. It pours cloudy deep brown - black with a decent tan head. The aroma is bright, fresh, fragrant, charred pine, resinous, grapefruit, roasted malt and toasted grass. The taste is dry, bitter, charred wood, earthy, toasty, roasted malt, cocoa, rindy, bitter orange and leather with a drying finish. Medium body and moderate carbonation. A pretty tasty cda. Floral hops, grass, dark, pine, toasted malts, some chocolate. Very dark, hazy brown, small, creamy, beige head. Light bitter. More dark, toasted malts, more floral, grassy hops, light charcoal, bitter orange peel, soft carbonation, medium bodied. Nice CDA, well-balanced. Bottle from Beers’n’More, Zurich, shared at CBC Islington tasting. Black with large brown head. Aroma is lychee, grapefruit, some chocolate, apples and lemonade. Taste is fruity sweet and fresh at first, with smooth bittersweet chocolate later. Smooth but a bit spiky. Drinkable and nice with long chocolate finish. Bottle. Roast with a hoppy friend, Coffe/dark choc, herbal/grass notes, toffee, light catty. Opaque brown, creamy brown lace. Creamy full body, nice espresso milkshake, good hop counterpoint, Dark chocolate toffees, nutella. Broad hop retronasal. NIce. (bottle) deepest brown colour with a creamy beige head. aroma of toasted grains and nutella, with lots of hazelnut husks, some clotted cream and salted caramel. flavour is mostly the same, lots of toasted grain and cream, with a very light touch of fresh banana, some earth and herbal hops in the light roasted-bitter finish. medium- to heavy-bodied with average carbonation.